Strong tide at the start so a lot of the fleet stayed well shy of the line but we pulled off a pretty good start and lead the fleet away. Mainly tide induced wind so pretty important to minimise the tacking on the beat to the Nab as the boat took time to get up to speed. Stayed in the main channel and tried to cover the fleet from the front. Whistler went to the Island side and this seemed to pay off as we went past Osborne Bay. Fairly nip and tuck on the beat to the Forts with Aviva, Long Pierre & Whistler but managed to get there first. Saw a couple of the other boats go into the Island but having made that mistake before we tacked along the channel. Dicing with Long Pierre for line honours at the Nab and just managed to get the inside line and came out in front for the long downwind leg back to the finish. Plenty of gybing practice on the fairly sedate run back to Cowes and made up some ground on Long Pierre who had pulled away from us down wind. Finished 2nd on the water by under 2 minutes and got first place on corrected by nearly 20. Also checking on the other two fleets we beat them by 10 minutes as well so all round our best performance in Jog we have ever had. 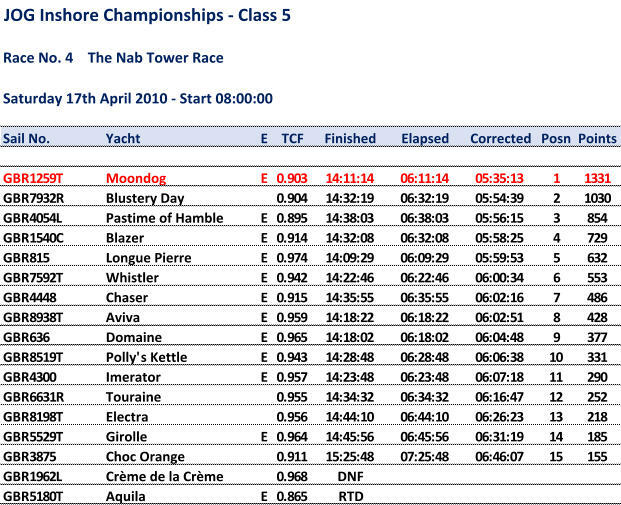 Report from Moondog Class 5 – Nab Tower Race What a race, what a result! Onboard for the race we had usual crew of brother Peter and myself and guesting for the second inshore race this season Robin Lawton, previous owner of Moondog when known as Lazy Bear. We were surprised to see the green flag course given the forecasts we had been looking at on Friday showing seriously light winds from around lunchtime however, full marks to the race officers for keeping with the full course and the winds were perfect (for us anyway). The start seemed very simple with an easy reach down the line from the shore and hardened up and crossed at full speed close to the buoy, all made easy by the majority of the fleet being line shy and Longue Pierre being a little early and having to gybe around to start and consequently having little boat speed at the gun. The beat to the forts went exceptionally well. We tried to keep in the strongest tide, keep tacking to as little as possible, as it took so long to get back up to speed, and loosely cover the fleet from ahead. There was the odd moment when a rival headed us but not for long as by the forts we were still in the lead. Boat speed compared to rivals was great, we were sailing with a twisted main with the boom quite well off the centre line. The leg to the Nab started as a beat but with a few miles left turned into a fetch. Tactic here was to keep in the Nab channel and thence strongest tide and take due note of the arrival and departure of shipping and tack to keep out of their way. Closing on the Nab Longue Pierre closed fast and it was touch and go whether we would have the pride of reaching it first but we reckon we had a nose in front at the Nab and as we had inside berth and came away with a couple of lengths in hand. Spinnakers up and the run home was slow and uneventful other than having to suddenly reach up to clear a cross channel ferry bearing down on us. Plenty of gybing and searching for the strongest tide. Longue Pierre overtook us fairly quickly and seemed to be easing away from us. We quite expected more higher raters to get passed us but none did. Once back in the Solent we seemed to hold Longue Pierre and at the finish were less than two minutes behind. We knew the result would be good and as always were unsure of the position of lower raters behind us especially as the tide to the finish was building and as usual favours the lower raters. We were pretty sure we had the win and were absolutely amazed to find we had won with nearly twenty minutes to spare on the next boat. Especially pleasing was to achieve 10 minute leads over class 3 and 4 winners. We don’t think we’ll ever be able to get the boat going that fast again against the opposition, still you never know!